Each region of Italy has its own unique charm in which the locals take immense pride, and Le Marche is no exception. The people have lived off the fertile land since 6000 BC, thousands of years before the time of the Etruscans. The region’s historical depth is evident in the extraordinary richness of the art and architecture of the walled cities and hilltop towns. 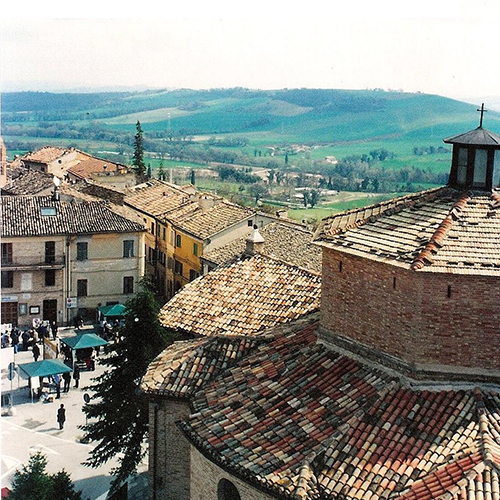 Even the smallest of the latter boasts a picturesque piazza and stunningly beautiful churches complete with amazing artworks. One example of Le Marche’s history you will not want to miss is that of the Roman ruins below Urbisaglia, one of the many hilltop towns close to La Vecchia Scuola. Urbisaglia sits above the lush valley of the Torrente Fiastra and overlooks the ruins of the Roman city of Urbs Salvia. Urbs Salvia is an important archaeological site and preserves an amphitheatre and theatre that you can visit as well as portions of the defensive walls and other buildings. There is an archaeological museum with some artefacts from this area in Urbisaglia.